Echinacea (Coneflower) is a North American native plant that is loved by both people and pollinators. Its colorful blooms last summer to fall and make these plants look great in so many settings! The prickly-headed coneflowers belong to the genus Echinacea, in the same family as black-eyed Susans (Rudbeckia). They are tough plants with coarse foliage, but their abundant bloom makes up for the rough edges. Coneflowers have grown in popularity, which has led to more options from bright single flowers to double blooms. Colors now include pale lemon yellow, creamy white, soft pink, rich magenta blooms, fruity orange flowers, and even fiery red varieties have come on the market and are all the rage. You’d be hard-pressed to not find a coneflower to your liking. Every garden needs at least one! 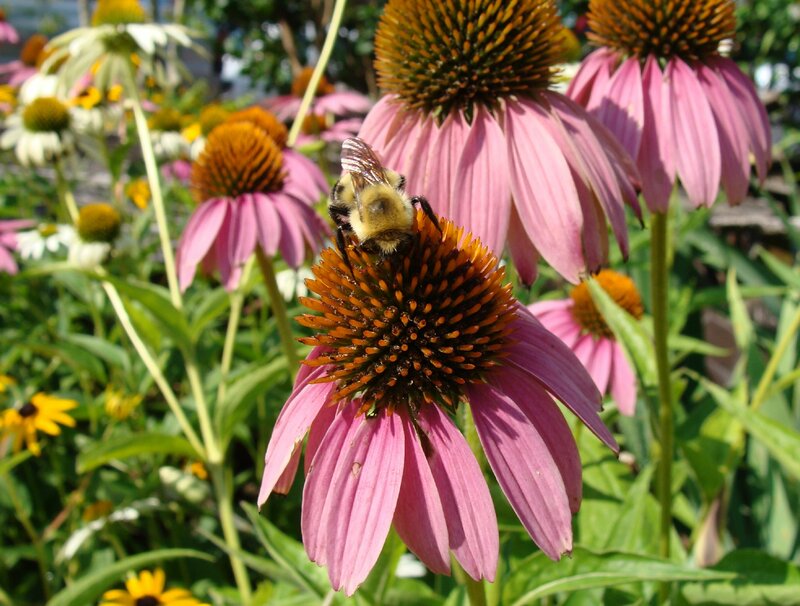 Purple coneflower is a garden staple that serves as a natural cold remedy. It has long been sought for its cold-fighting properties, especially in teas. All parts of the plant are proven to have immune-boosting effects, along with a number of other beneficial attributes. Coneflowers need a location with full sun or mostly sun, and they’ll bloom from summer through early autumn or longer if you keep dead flowers picked off. They are native to grass prairies so they need well-drained soils. These are tough and rugged plants. Coneflowers are native to the eastern and central U. S., and they thrive in Zones 5-8. 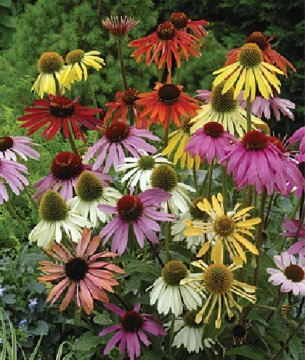 They should be watered regularly their first season in the garden, but well-established coneflowers tolerate heat and drought. Don’t pamper them: they are not bothered by pests and do not need fertilizer. 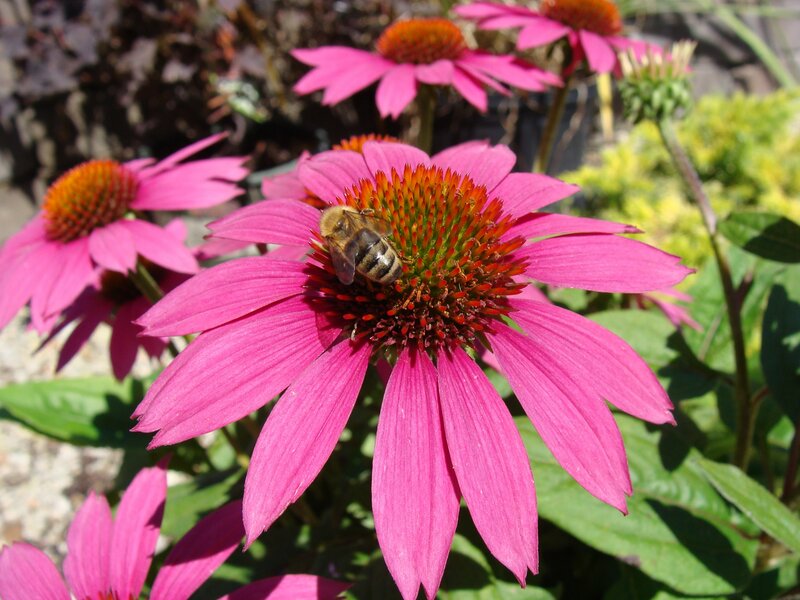 Grow Echinacea plants in spring from seed or potted nursery plants – or divide them in spring or fall. Use coneflowers in wide borders with other robust perennials, like gloriosa daisies, or on the outskirts of gardens (they go dormant in winter). They do well among other perennial plants, but don’t pack them in too closely, since root competition makes them struggle. In early spring, cut the old flowerstalks back, and get ready for a fresh season of colorful, long-lasting, perennial blooms. As fall sets in, leave a few blossoms on the plant, because they make great food for small birds. Goldfinches love sitting atop spent blooms and picking away at the tasty seeds. If left on the plant, coneflowers may reseed. Just know that any seedlings will be different from the parent, especially in the fancier varieties. An issue to be addressed with coneflowers—and other plants in aster family—is aster yellows. Aster yellows is a plant virus carried by thrips, which feed on pollen and carry the virus plant to plant. Symptoms are most visible on new buds and open flowers show erratic, contorted growth. If you see this on your plant, there is no cure except to dig up the plant and properly dispose of it before the disease spreads.